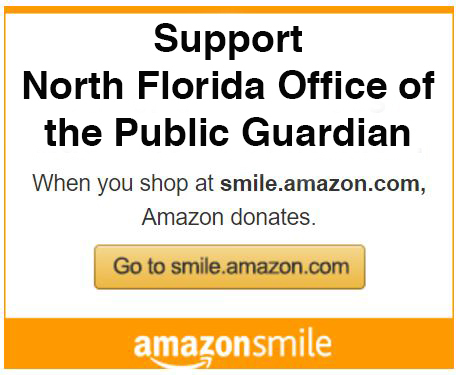 The Office of Public Guardian, Inc. (OPG) is organized as a not-for-profit organization pursuant to Chapter 617, Florida Statutes. The corporation has federal 501(c)(3) tax-exempt status. There is a volunteer board of directors comprised of community members who are responsible for policy development and direction. The Office of Public Guardian, Inc., has a well-qualified staff. Florida law requires that each office of public guardian maintain a staff or contract with professionally qualified individuals to carry out the guardianship functions, including an attorney experienced in probate areas and at least one other person who has a master’s degree in social work, a gerontologist or a nurse. The Office of Public Guardian, Inc., is very fortunate to have on staff one attorney, four master’s level social workers, and two social worker with a bachelor’s degree and over 15 years of social work experience. There is also an accounts manager and a paralegal/administrative assistant on staff. Collectively, the staff has over 40 years of public guardianship experience.History. Although the corporate entity, Office of Public Guardian, Inc., was established February 2003, the Office of Public Guardian for the Second Judicial Circuit has been in existence since 1986. The first public guardianship program in North Florida, OPG was established as a demonstration project by the Florida Legislature on October 1, 1986. At that time it was a state program operated by the court system and completely funded by the state. In 1998, the Florida Legislature created a Statewide Public Guardianship Office (SPGO) to oversee all of the public guardianship programs in the state. SPGO spearheaded the privatization of the North Florida OPG and in February 2003, the employees of OPG recruited community members to serve on the board of directors and continued operating the public guardianship program through a contract with SPGO. Undergoing privatization in this manner assured no disruption in service to wards. In 2002, the grassroots organization, People Without Guardians Project, based in Marianna, FL, outlined the need for public guardianship in Northwest Florida. It initially identified hundreds of persons with developmental disabilities who had no significant family or friends available to serve as guardian. Later, the group focused on the approximately 40 persons who had already been adjudicated by a court, but whose guardians had died or were otherwise unavailable. In 2003, the Florida Developmental Disabilities Council funded the public guardianship expansion into Northwest Florida counties to provide guardianship services for those persons identified. Unfortunately, that funding was for initial start-up costs and the need for a continuous funding source for the program remains. In 2014, SPGO appointed OPG to two additional circuits: 14th and 4th. Oversight and Monitoring. The Office of Public Guardian, Inc., is subject to oversight and monitoring by the Florida Department of Elder Affairs, Statewide Public Guardianship Office. Each guardianship case is subject to the authority of a circuit court judge. The judge and clerk of the court review annual reports that detail the personal plan of each ward and the fiscal accounting of each ward. Section 744.708, F.S., requires an independent audit of the program be performed at least every two years by a qualified, certified public accountant. Arranging Do Not Resuscitate, Termination of Life Support orders and burial arrangements when necessary. Legal Unit – The Attorney/Director prepares annual reports, requests for authorized actions, attends hearings and serves as attorney of the guardianship estate, supervises the Case Management and Fiscal Units. Case Management Unit – The Case Managers/Guardian Representatives are primarily responsible for ward visitation. Florida law requires wards to be seen once a quarter by the guardian. OPG visits wards at least once a month and more frequently when the ward’s condition is unstable or the ward is hospitalized. Case Managers also inventory property and request expenditures be made with ward resources for the ward’s behalf. Fiscal Unit – Receives wards’ income, accounts for each receipt and each expenditure per ward, pays wards’ bills, and prepares financial reports for the court. Counties Served. Bay, Calhoun, Clay, Columbia, Dixie, Duval, Franklin, Gadsden, Gulf, Hamilton, Holmes, Jackson, Jefferson, Lafayette, Leon, Liberty, Madison, Nassau, Taylor, Suwanee, Wakulla, and Washington.